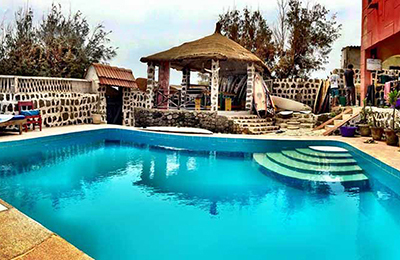 Yoff beach Surf House - Yoff, Dakar Guests overall rating: ☆☆☆☆☆ 0 based on 0 reviews. Dakar Surf Yoga House Senegal has a variety of room typesfrom private to shared. The rooms have a fan and mosquito nets on the windows and above each bed. Every evening we make the surfing program for the next day, according to our guests surfing abilities and swell direction. We make sure that everybody improve and enjoy every moment in the water! We have a van and a boat that waits for us while we surf! Beach volleyball, SUP and Yoga are available. And if you just want to chill with us on the rooftop and enjoy the camp athmosphere, you can still book a room at our place! We are open all the year long. Dakar Surf Yoga House Senegal has a variety of room types double rooms with private bathroom, single private room with private bathroom, family rooms with private bathroom, as well as twin rooms and a dormitory with common bathrooms. Personal lockers for your personal items. Roof terrace to enjoy the sunset and sunrise and to watch the waves rolling in. A big breakfast is waiting for you, which includes: milk, coffee, tea, juice, bread, butter, chocolate, cheese and marmalade. Our marmalade is produced in Senegal and we have the following flavours: bissup (from the ibiscus tree), baobab, mango and papaya. Senegal cooking is very healthy. At Dakar Surf Yoga House Senegal we offer a range of local specialities and so you are always in for a treat with a hearty and delicious meal. We do offer vegetarian and vegan options, just tell us in advance. 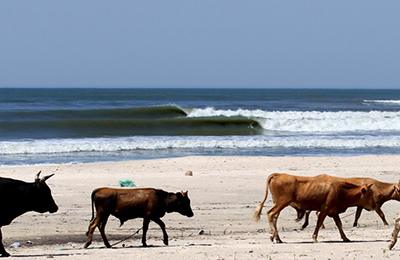 Learn to surf with us: after a theory session on the sand you will head into the water to practice what you learnt. Step by step we will help you ride your fist wave and have loads of fun! If you need to improve your skills on green waves, Senegal is your good choice because of the frequency and the quality of waves. 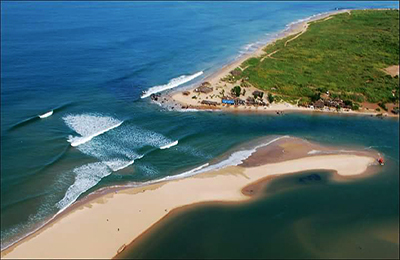 We will teach you at some easy rocky spots like Secret (North coast) or Yene (South coast), while if you just need to be guided to some of the world class waves Dakar has to offer, we will take you to the popular waves of Ouakam, Club Med and Ngor. Beginners can ride their first waves in the beach just in front, where our local teachers will be happy to help you to learn surfing in a friendly and proferssional way! In the evening you can enjoy beach volley play game with professional players and 2 big courts, or yoga session with Katie, massages and taste the local the in the sunset! 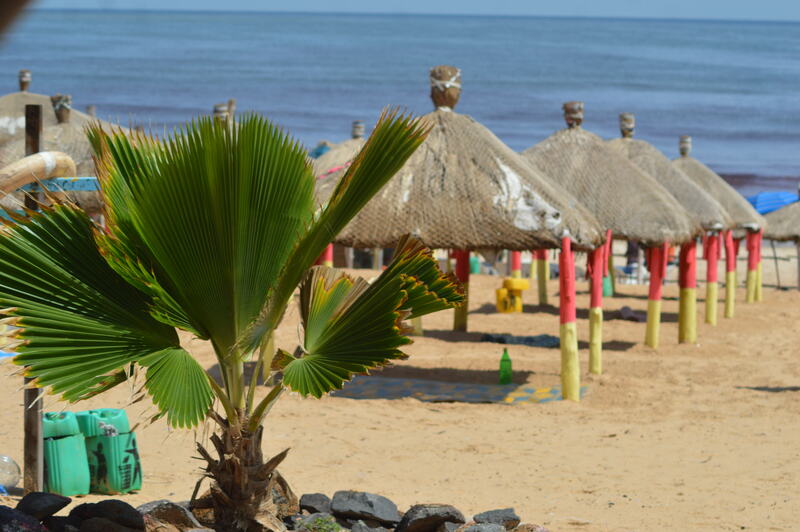 Aziz will be happy to drive you to discover Senegal, with his 4×4 to the beach until the desert! Dakar Surf Yoga House Senegal is located in the new area wich is BCEAO. In this area you can find all the services you might need: supermarket, bank, pharmacy, shops, fast foods and restaurants. From Yoff it’s also super easy to go surfing, as from the mainland it takes only 15 minutes to reach the Almadies peninsula, where the most popluar breaks are (Club Med, Vivier, Secret) or Ouakam. By taxi or rental car. Pick up at the airport in DIASS is also possible as extra service for both locations. Visit to the pink lake offered in the case of no waves. Pick up at the airport in DIASS is also possible as extra service.